Michelle Lynn Mendelsberg joined the firm in December of 2004, working her way up to senior legal assistant while attending Salmon P. Chase College of Law as a part-time law student. Michelle joined the law firm as an associate in November of 2009 concentrating on personal injury law. 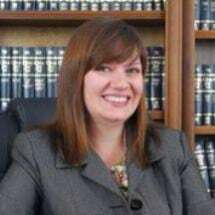 While at Salmon P. Chase College of Law, Michelle maintained positions as Events Coordinator (2005) and Treasurer (2006) of the Women's Law Caucus. One of her duties as the Events Coordinator was to organize and lead the annual food drive program in coordination with the FreeStore FoodBank of <?xml:namespace prefix = st1 ns = """urn:schemas-microsoft-com:office:smarttags""" />Cincinnati . Outside of education and employment, Michelle has been an active volunteer for the Women's Crisis Center of Northern Kentucky since March of 2007. Michelle is a member of the Cincinnati Bar Association, Ohio State Bar Association and the American Bar Association. Michelle is admitted to the practice of law in Ohio .